New owner Dejphon Chansiri wants to take the Owls back to the Premier League in time for the club’s 150th anniversary in 2017. Chansiri officially received the club from out-going owner Milan Mandaric this morning at a packed media call at Hillsborough. And he spoke of his desire to restore Wednesday to the top flight as soon as possible. “I share a dream with everyone involved in Sheffield Wednesday that we can celebrate our 150th anniversary back in the Premier League,” Chansiri said. “Seeing as the club will celebrate it’s 150th anniversary in 2017, that will be the approximate goal to see them back in the Premier League. 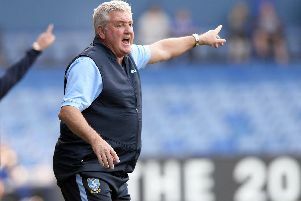 “I’m developing plans over the short, medium and long term to maximise the sporting potential of Sheffield Wednesday in a healthy and sustainable manner. “Everywhere I go in Sheffield and England, I see the huge importance of the club not just for the city but within the whole football family. “I intend to respect the rich history and heritage of the club the supporters are rightly proud of. “I’m looking forward to the challenges ahead and believe together we can achieve great success. Ratification of the deal by the Football League is considered to be a formality at this point. Chansiri, whose family have controlling interest in Thai Union Frozen Group, has acquired a 100 per cent stake in the Championship club. The Thai Union Group is the world’s largest producer of canned tuna. Chansiri revealed he has purchased the club with funds generated from his own real estate and construction businesses. Since Christmas, Chansiri and his advisors have been regular visitors at Hillsborough matches since Christmas. The businessman’s son Att was a club mascot for the Boxing Day win over bottom-of-the-table Blackpool and Chansiri junior’s passion for football was a strong influence behind his purchase of the club. The buyout brings an end to Mandaric’s four-year stint as owner of the club, and although he is set to step down as chairman and as a director, he will remain at Hillsborough in an advisory role. Mandaric gave his backing to the new owner and promised to help his cause in any way he can. He said: “Not long ago when I first met Mr Chansiri, I knew immediately I was dealing with a very credibly person, a very enthuastic person and a winner. “I thought at that time that it would be great if we could put a deal together and take the club from this point to where all our great supporters deserve it to be. “I will do everything on my side to give full commitment when he needs it and I hope all our supporters, as I’m sure they will, will do the same thing. Under that kind of relationship I’m sure he will.